Welcome to the Manchester City Away Kit shop at Soccer Box. This is the place to buy the latest shirts, shorts and socks that make up the Manchester City kit. At Soccer Box we have sizes available to fit football fans of all ages, from baby kits to XXXL adult jerseys. Nike is the manufacturer of the soccer kits. When you shop at Soccer Box you are buying official merchandise that has been supplied directly from Nike. The traditional color of the away kit is burgundy, or red and black however, over recent years more eclectic styles have been introduced. With Nike at the helm of kit design Manchester City is sure to launch some stunning soccer kits, make Soccer Box your 1st choice store when choosing to buy a your new away kit. Shop for your MCFC Away Kits at Soccer Box your authorized Nike stockist! 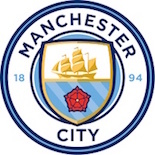 The previous manufacturer of the Manchester City soccer kits was Umbro, which was a subsidiary of Nike. When Nike sold Umbro they negotiated terms to take over the kit contract. Beginning from the 2013 - 2014 season Nike will make the team’s kits for at least 6 seasons in a deal that is worth £12m per year. Manchester City has been flying high at the top of the Premier League for the past few seasons. After a period of decline, even being relegated as far down as the 3rd tier of English soccer, the team has had a remarkable comeback. Since the Abu Dhabi United Group invested in the club in 2008 several new high profile players have been bought in to wear the new kits. In 2011 Manchester City lifted the FA Cup trophy sealing their return as one of the big players in Premier League football. The following season they lifted the Premier League title much to the delight of their fans. With such phenomenal and increasing success the soccer kits have soared in popularity. The home and away kits are selling fast, you can even shop for the Manchester City training kit. Youngsters that may have been drawn towards their rivals United in the past are now flocking to support the Sky Blue’s, as they idolize the players and want to play like the professionals. The away kit is available now in the Soccer Box shop. At Soccer Box we can offer you the opportunity to get your kit printed with official Premier League lettering. Whether you choose the infant or kids away kit, or a shirt in an adult size we can add any name and number you choose. The first team squad is a line-up of world-class football players, if you have a favorite player make your away kit extra special by adding their name and number. If you prefer we can add your own name for added personalization. Order the official Manchester City away kits at Soccer Box now. We offer a range of shipping options to suit your needs including international and express!